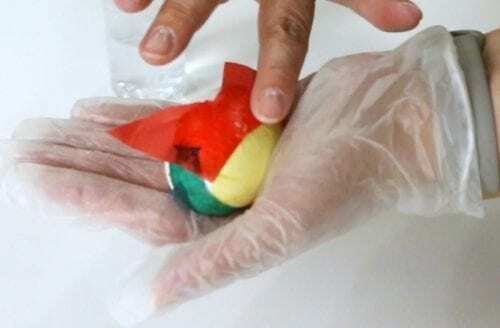 An easy DIY craft tutorial idea that teaches how to dye Easter Eggs with Bleeding Tissue Paper. Perfect for Easter Egg Hunts or the Easter Basket. 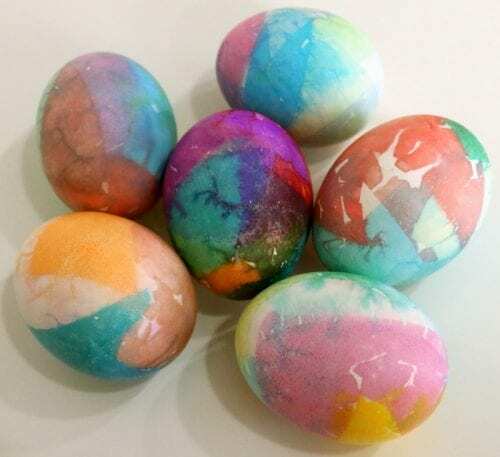 Are you looking for a fun and creative way to dye your Easter Eggs this year? The Tissue paper technique is so much fun and leaves you with beautiful multicolored dyed eggs! It is very important to make sure you have Bleeding Tissue Paper. Most tissue papers you purchase for gift packaging are non-bleeding, make sure the packaging says bleeding. I had a very hard time finding it in local stores. Michaels said they had some but when I was in store I couldn’t find it. I spoke with an employee that ensured me this package was bleeding tissue paper. I was nervous to try, but it totally worked. So if you are getting your bleeding tissue paper at Michaels you want the Celebrate It Solid Tissue 20 Sheet variety pack, UPC: 0010060688. Or you can make life easy and get it on Amazon. My Tissue Paper Dyed Easter Eggs are a mix of many colors. I cut a square out of all of the layers of tissue paper and then cut them into a couple different shapes. 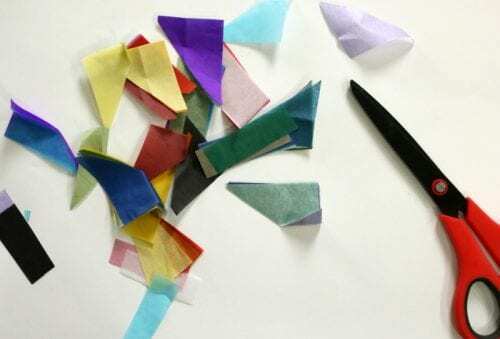 If you want only specific colors then only grab those colored sheets of tissue papers and cut into shapes or strips. The dye from the tissue paper can stain your skin, so make sure to wear a pair of disposable gloves. 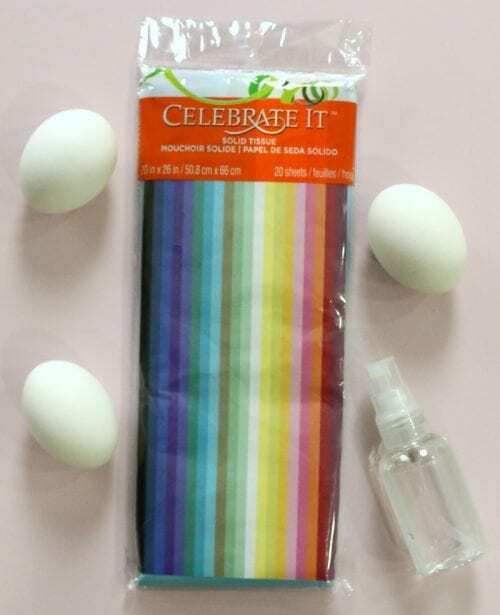 Using a small spray bottle with water inside, spray the egg and then lay the strips of tissue paper over the egg. Cover the entire egg with the strips and spray with more water as needed. Let the eggs dry for at least 10 minutes. The longer they dry the more dye that will transfer to the egg. As you peel the tissue paper away from the egg, you’ll see all of the pretty colors that it left behind. Each egg is a fun surprise as it is unwrapped! Each egg is totally unique and I love how the colors blended together where the tissue paper overlapped. 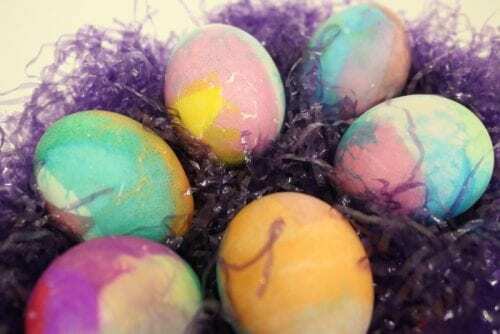 These Tissue Paper Dyed Easter Eggs are perfect for the Easter Basket, the neighborhood Easter Egg Hunt or just to have something pretty to eat! 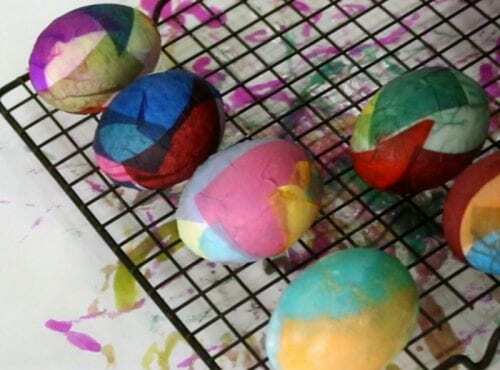 SAVE HOW TO DYE EASTER EGGS WITH TISSUE PAPER TO YOUR FAVORITE EASTER PINTEREST BOARD!